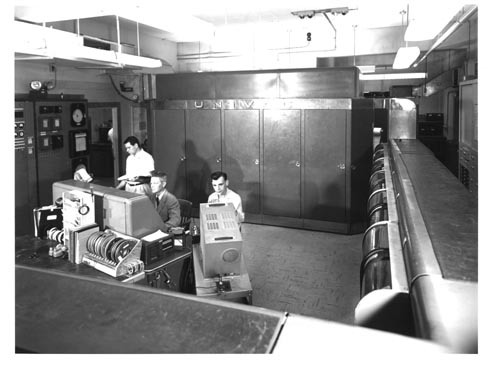 with UNIVAC on top panel. To the right are a series of unidentifed devices and to the left are control cabinets with meters and dials. In front of the console is a desk with tape reels and other items. Verso: Paper label: "Lawrence Livermore Laboratory University of California Graphics Division Neg. No. GLB557-3800( scratched out)"